Welcome to the Faithful Five home page. From 1992 until 2001, we were an a capella singing group based in Tucson, Arizona. Only one of us is a professional musician, and he's a high school music teacher, not a professional singer. We're basically just people that grew up in the church loving to sing in harmony with other singers. Through the ages, that's always been one of the great things about the Christian church. The church has been a bastion of music and a home for musicians. Certainly when it comes to choral music, the same holds true today. We have made two CDs. 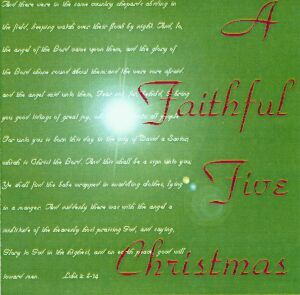 The first one, "A Faithful Five Christmas," was recorded in 1999 over and between the sounds of police helicopters, Friday night cruisers on Park Avenue, and the groaning air conditioning system in our church, the First United Methodist Church, near the University of Arizona. We used two old choir mikes and a little tape recorder. Recording was simple; we just rolled the tape, sang each song three times, picked the best version of each, and printed them on Lori's CD burner on her home computer one at a time. Everything was done "live" -- no mixing or mastering was possible. The recording process only took a few hours. We made our second record in 2000. We hired an engineer and a recording studio for this one. It's all still live, but it's amazing what a difference having some nice mikes, a quiet room, and professional-quality recording equipment makes. As of the summer of 2001, the Faithful Five are no more. Our careers have pulled us apart after 9 years of singing together. Barry left Tucson in July to take a job teaching choral music at a high school in Las Vegas. He hated leaving his home town, but the move represented a big pay hike for him, and it was too good to pass up. Lee left Tucson at the end of the year to fulfill a long-time dream of becoming a university professor. Danny is singing at Our Saviour Lutheran Church now, on Campbell north of Speedway. Lori and Rejeana are still loving life in our beautiful church, although rumor has it that they've turned into real slackers when it comes to showing up for choir. We loved singing together more than anything. 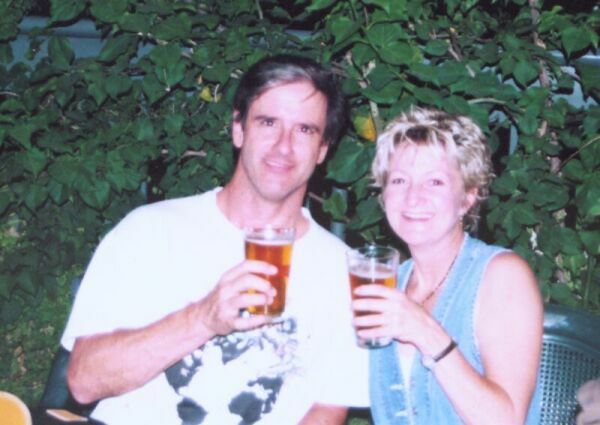 We were lucky to have found each other -- we were the greatest friends in the world, still are, for that matter, and we hoisted many a glass together. Here's to the Faithful Five! 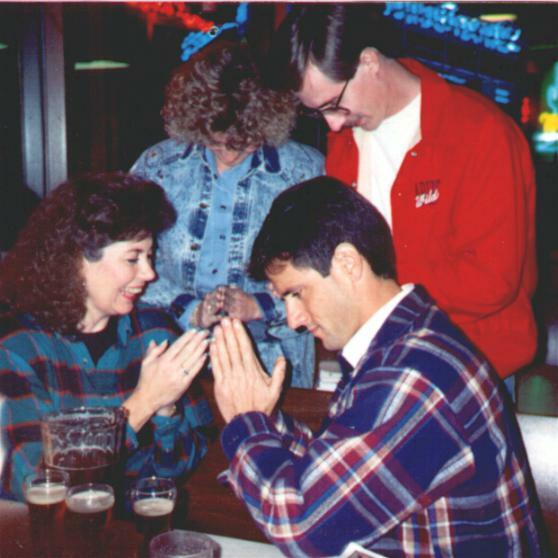 Here we see the Faithful at one of our first-ever prayer meetings -- this photo was probably taken in 1992. We originally met, like the early Christians in the catacombs underneath Rome, in a little-known beer hall called "Mike's Place." Mike's had cracked linoleum floors, harsh fluorescent lighting, a filthy unisex bathroom with a broken lock, and big, cold pitchers of Killian Red for $3.95. I came to dearly love that place; it was a sad day for the Faithful when it was razed for "urban renewal." The Faithful Five were spotted on a warm spring evening several years ago at a charity gala in the company of man-about-town and future mayor of Tucson Bob Walkup and his beautiful wife, Beth. These two notables were the driving forces behind a fundraiser for the Tucson Children's Museum at Tucson Greyhound Park. It was a black-tie Fortie's affair, with dinner in the clubhouse, greyhound races outside the big windows, and entertainment including a big jazz band, an acting troupe, and featured musical guests, the Faithful Five.